Beekeeping kit - Cifarelli S.p.A. The blower is used in beekeeping for the removal of the bees from the melarium during the cleaning of the honeycombs that precedes the honey extraction phase. Thanks to the volume of air generated by the blower, the operation is carried out quickly and without causing damage to the bees. The beekeeping kit is an accessory composed of a 2 m long flexible tube and a "duck beak" diffuser that widens the outlet flow. This allows you to simplify the work by optimally directing the air to the hive's melarium. 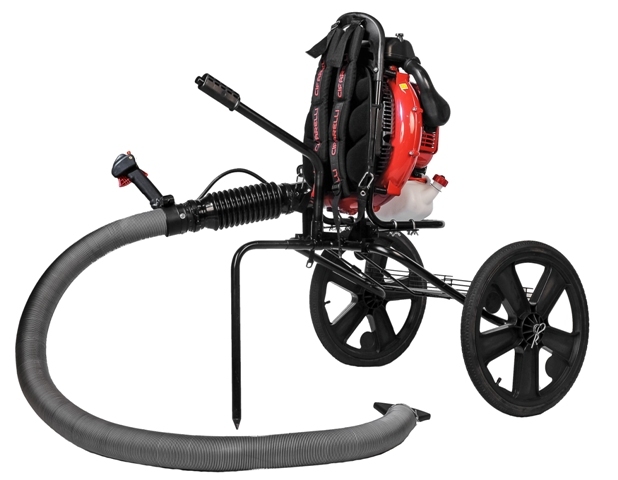 To work in flat or easily accessible areas, it is possible to place the machine on the trolley for V1200 vacuum (code 99.310.01), applying the supports for the BL1200 blower assembly (code 0G.382.00). The beekeeping kit can be applied both to the BL1200 blower and to the M1200 atomizer (if equipped with a pump it is advisable to disassemble it when used as a blower to avoid damaging it).